Refugees in Lebanon have always occupied the lowest level of the Lebanese social pyramid, often denied access to public services, and not even being legally recognized as refugees. From the refugee perspective, citizenship, however produced within a wavering and corrupted state system, seems to be the only tool guaranteeing basic services. The present paper shows how, in particular cases like the Beirut suburb of Hay al-Gharbe—inhabited by refugees, migrant workers, and a small number of disadvantaged Lebanese—citizenship rather than refugeehood is the legal status preventing the vulnerable from accessing any assistance regime in Lebanon. Their chronic vulnerability forces them to make a constant effort to adapt to poverty. The recent gentrification of the periphery and its external stigmatization as wholly vulnerable ended up obscuring internal exclusion and inclusion phenomena, rarely discussed in relation to people’s everyday pragmatics of survival. In this framework, while refugee and migrant workers’ poverties have become the only external interpretative lens to explore vulnerability in Lebanon, a kind of urban poverty, which is neither connected to the political violence of regional wars nor to the flawed refugee regime, will be investigated through ethnographic methods. To cite this paper: Estella Carpi, "Revisiting Vulnerability in a Slum of Beirut: when Citizenship Disempowers", Civil Society Knowledge Centre, Lebanon Support, 2015-07-01 00:00:00. Beirut’s southern suburbs, considered the “periphery” par excellence in Lebanon, were named “Dahiye” in 1982 after being called the “belt of misery”—hizam al bu's—in addition to Southern Metn. Dahiye is located between the agro-industrial area of the district of Choueifat and the municipality of Hadath.1 Nowadays, the southern suburbs of the Lebanese capital are mostly administered by the main Shiite party Hezbollah, which prevailed over the minor Shiite party Harakat Amal in the 1990s. The homogenisation of a desolate and miserable Dahiye has often overshadowed the different causes of local chronic poverty and the emerging forms of exclusion not merely triggered by migration flows, refugee crises, or abstract economic structures, but rather by political issues that remain unaddressed at the domestic and international levels. The 2006 reconstruction of Beirut’s Dahiye has been monopolized by the Waad project designed by the Iranian-funded NGO Jihad al-Binaa, the most successful reconstructor in the areas directly affected by the 2006 July war that are indistinctively viewed as politically marked by Hezbollah’s governance. The reconstruction efforts left unaddressed the areas of Dahiye suffering from perennial vulnerability,2 and generally constituting politically “anonymous” spaces or politically unaffiliated ones. These Dahiye neighbourhoods, like the illegal settlement of Hay al-Gharbe—subject of analysis in my field research from 2011 to 2013—have actually not been the targets of military attacks and, therefore, have never been declared in a ‘state of emergency’. I will therefore illustrate how the social milieu of Hay al-Gharbe is discussed by those of its inhabitants who are affected by non-war related vulnerability. This paper also shows how the lack of local welfare affects individuals in areas neglected by both the state and non-state actors when emergency politics govern the social spaces. In this framework, human behaviour is not framed by the structural character of urban poverty, but by the subject’s cultural perceptions,3 which also entails different imaginations and social schemes of poverty within the Lebanese scenario.4 The array of norms and values that underlie such schemes emerge from the human adaptability to the poverty experience. The Hay al-Gharbe study stands in contrast with the only possibility of practical citizenship in the Dahiye area, which is political affiliation to, local compliance with, or non-contestation of the dominant social ethics. In the framework of my doctoral research, I have carried out approximately 90 in-depth interviews between September 2011 and November 2013 with Dahiye’s residents, who had been beneficiaries or non-beneficiaries of the humanitarian aid provided during and after the 2006 Lebanon-Israel July war — harb tammuz — which caused an unprecedented level of infrastructural destruction in Lebanon. I also conducted 68 semi-structured interviews in different suburbs of Beirut with international and local non-governmental organizations, UN agencies, and local municipalities, which provided humanitarian assistance to the displaced in 2006. In the interpretation of data and analysis of findings, I have privileged a qualitative ethnographic approach in order to experience the answers provided by my interlocutors rather than merely collecting and reporting their verbal accounts. Thus, everyday participant observation — a classical research tool in anthropology — has allowed a more comprehensive understanding of the daily frames mentioned in the present article and is here considered as the primary epistemological source. As will be evident, a wider qualitative analysis of how social spaces turn into humanitarian scenarios has provided me with the possibility to explore the gray areas of vulnerability lying between refugeehood and citizenship, and therefore unearthing the understudied inequalities of Dahiye. Hay-Gharbe is an illegal settlement bordering the Palestinian camp of Shatila and the former camp of Sabra — now simply called tajammu‘, “settlement” — under the municipality of al-Ghobeiry, which is administered by the main Shiite Lebanese party Hezbollah. Sabra and Shatila became notorious because of the massacres perpetrated by the Israeli-Phalangist alliance in September 1982 during the Lebanese Civil War (1975-1990). The borders of this settlement are not merely physical; they are connected to community identities. In fact, its configuration changed during the Lebanese Civil War because of the inhabitants’ migration to the current stadium, Camille Chamoun (al-medina ar-riadiyya), as a result of the frequent bombing of the Palestinian camps at that time, and the fighting between different political factions. In order to renovate the stadium in 1992, the occupants, former inhabitants of Hay al-Gharbe, were evicted, and returned to the settlement. The settlement has always been distinguished from the Shatila camp for its varied urban composition. Moreover, the residents themselves often expressed their refusal to be associated with the Palestinian refugee camp, as the latter was a frequent target of attacks by various political forces and, therefore, drawing special attention from international politics. The majority of Hay al-Gharbe’s residents are Dom (72%), descendants of nomads who populated the courts of India between the third and tenth centuries, and who are now based in the Middle East. The settlement is also inhabited by Palestinians who have not found accommodation in the refugee camps; regional refugees and migrant workers from Asia and Africa (especially Iraqis, Sri Lankans, and Syrians) also make up a sizeable percentage of Hay al-Gharbe’s residents, and form a marginalized sphere in the multifaceted reality of Dahiye. Hence, Lebanese citizens make up only a small portion of the suburb’s population. In general, the rapid urbanization process that rural immigrants underwent has paved the way to the formation of illegal settlements, the dismantling of which remains difficult in a country where the institutions are too lax and corrupt to enforce rules. The Lebanese government, for its part, has no interest in investing in the development of infrastructural areas that have proliferated illegally. "I never leave the house, I find it humiliating... look at my shoes, they are unpaired and I cannot afford to buy new ones. I have no friends; if you hang out with them, they just talk about what they have. And then, I have nothing to tell… That’s fine, I got used to it. If I didn’t, I would suffer." "I would like to send my children to school now, but it's a damn vicious cycle: with what money could I do it? They will die the same way I will: with no one being there to take care of them." "The Syrians stole my job, and my Lebanese boss simply wanted someone more exploitable than me. I transferred the Lebanese citizenship to the whole family, but this didn’t change much for us. We didn’t ‘welcome’ any Israeli missile here in the house. And, with the Hezbollah administration, this is how it works: no physical damage caused by Israel, no help for you. You need to know that the few families that own citizenship in Hay al-Gharbe have pledged their loyalty to local parties, by voting for them in local elections. Candidates promise to provide more affordable generators, manage better garbage dumps, and give good quality water. What we would do for some good quality water! In order not to pay for drinking water, some residents literally enslave themselves to political parties… Can you see my daughter’s hijab? She doesn’t wear it because she really wants it, or because we want that… She wears it because she started losing her hair due to the salty water of the shower!" Najwan and her family—half-Palestinian, half-Lebanese—did not embody the precariousness resulting from war emergencies, but rather, the vulnerability addressable by long-term humanitarian assistance for Palestinians. At the same time, Najwan’s family is associated with chronic poverty caused and exacerbated by sporadic displacements during the civil war, and discriminatory state (and NGOs) policies. "Thanks to the Beit Atfal as-Sumud (‘The [Palestinian] House of Steadfast Children’), we’re provided with livelihoods, which, however, are only sufficient to survive.15Lebanese people like my father never had wasta [useful personal connections], and so we never accessed public services, which are too expensive for us... Can you believe me? What’s the use, then, of the Lebanese nationality! Here we have no drinking water, no electricity; there is only one school and a health service provider in the district thanks to few associations. Yet no national army here protects us, neither the police nor the state... No one cares at all." "I fought with Fatah ad-Dahiye in the ‘war of the camps’ in 1987. At that time, they were making many promises: 'If you fight, you will receive whatever you and your family need'. I haven’t seen any improvement, any help. I'm just sick of seeing lies parading as revolutions and resistances. My life is so much worse now than in the years of the Civil War." "Nothing belongs to us here. The land belongs to the municipality, and they could evict us whenever they want. That’s why we live locked in the house. Unless we show our face, most of us go unnoticed and get forgotten. And the more we are forgotten, the better. There is no safety. I forget what there is outside, and thanks to this I resist." The invisibility of Hay al-Gharbe, even within the outskirts of Dahiye, is due to the longstanding state neglect and the lack of interest of international humanitarian organizations, which tend to intervene in areas that are less involved in global politics. After the Pyrrhic victory of Hezbollah in the 2006 July war, the party reached its greatest popularity by distributing resources with no sectarian discrimination; the most heavily bombed districts of Dahiye, therefore, reached unprecedented levels of economic development and gentrification (i.e. Haret Hreik and Bi’r Hassan). In fact, the new emerging class of local engineers and architects was largely employed in the reconstruction process. Nevertheless, as the people’s accounts of their everyday life have shown so far, postwar reconstruction engendered new local inequalities. It is telling that, in the eyes of the local residents, political affiliation and social networks of wasta seem to be the only determining factors for them to benefit from any assistance regime, even for Lebanese citizens. Acts of assistance and support are designed to serve the average citizen of Dahiye, representing the first stage of a social contract between the citizen and the municipality and its affiliated local organizations, rather than between the citizen and the central state. However, this “local social contract”, inexistent at a national level, is rejected by those citizens of Dahiye who remain reluctant in front of the hegemonic municipal project: the only one able to provide a tangible citizenship scheme in the southern suburbs. Within the framework of a confessional political system and ethnic-based social inequality, the growing ethnic diversity of Hay al-Gharbe does not facilitate the affiliation of heterogeneous residents with specific political factions, which would be able, in turn, to draw international attention and provide basic services to the neighbourhood. The Hay al-Gharbe case study reveals that Dahiye’s spotted poverty is shaped by identity politics and not only by socio-economic matters. The fact that international humanitarianism tends not to intervene in places where there are no political interests is empirically confirmed by the existence — and chronic predicament — of this illegal settlement. Most of the humanitarian industry ignored the slum as much as the Lebanese state did. In fact, the major reason for wartime interventions is the official declaration of a state of ‘emergency’, but it should be traced back to the political marker that a territory is vested with. That is the reason for war breaking out in specific places in Lebanon or elsewhere. In this sense, both non-state and state actors are seen as neglecters of a space that is not considered “humanizable”,21 in that it resides outside of their political agenda. It should be noted that Lebanon is not a signatory to the 1951 Convention for Refugees, and it is therefore classified as a transit country. With regards to this, Palestinian, Iraqi, and Sudanese refugees, even if they cannot gain a legitimate status that ascertains their vulnerability as refugees, are still classified as de facto suitable for aid, however insufficient and uncoordinated. The territorial politics of Dahiye’s reconstruction project were successful in compensating the war-stricken within a short period of time, and with no confessional discrimination, confirming the continuity between urban destruction due to war, and reconstruction as a reversal of that process in hegemonic spaces. Nevertheless, within the broader Lebanese confessional and ethnic demographics, such continuity is disrupted whenever a urban district contingently lacks political attention due to its less definable social identity. Aside from the central state’s abdication of responsibilities, Hay al-Gharbe’s persistently dire conditions are a postwar checkmate to the over-celebrated Waad reconstruction project in Dahiye. The Waad project’s redistribution of resources has been deemed as equal and efficient, owing to compensation strategies meant to erase the sense of destruction from the public sphere, and avoid a generalized resentment against Hezbollah in the aftermath of the 2006 war. Unlike Hay al-Gharbe, the dominant Dahiye, commonly referred to as ad-Dahiye al-mazbuta,23 is well known to outsiders both because of the Israeli bombing that hit the area countless times in Lebanon’s history, and because it is considered in international media as Hezbollah’s stronghold. The section of the periphery destroyed by the Israeli aviation has been viewed as a place of choice. Seeing as these gentrified districts are the only place where the Dahiye municipalities and Hezbollah-affiliated organizations provide basic services and entertainments,24 people’s desire to become civic members of Dahiye has become much stronger. On the other hand, Hay al-Gharbe is a place where people end up residing out of necessity, but also because they are unwanted and out of necessity, constituting one of the microcosms of citizen exclusions in Lebanon. Hay al-Gharbe cannot be considered as a “space of choice” in that the inhabitants do not have the opportunity to challenge the predominant narrative of class and citizenship, which contributes to the affirmation of certain social hierarchies. This happens due to the impossibility of ‘public standing’,25 that is to say claiming legal, civic, and social rights in the capacity of citizens in the Dahiye space. The residents, not owning the land, cannot even claim any right to mobilize, as urban residency is normally the basis for mobilization. In fact, in those areas where public space attracts humiliation and the fear of moving, an indoor life is preferred, and vulnerability remains the mainstream discourse in the classical fields of refugeehood and economic migration. In this scenario, citizenship can be conceived as the mere shadowing and managing of Lebanon’s differences, and is enacted through protection and service provision whenever the underlying power relations express their assertiveness in favour of the beneficiary. 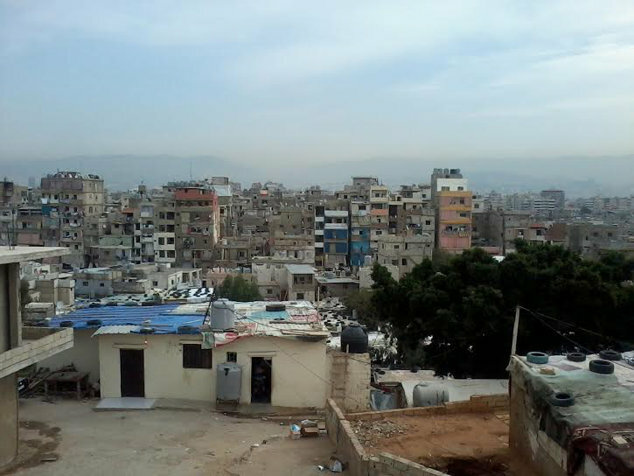 In order to discuss citizenship in Hay al-Gharbe and the role of citizens’ legal status in denying them access to welfare regimes, it is useful to mention the eternal anti-state rhetoric present in the southern suburbs of Beirut: a rhetoric which, though inflated by Hezbollah to gain local consensus, is produced by the longstanding state abandonment of the area, and even state hostility, largely perceived at a local level. This hegemonic project of territorial citizenship is referred to and experienced in opposition to the central state, even when the boundaries between the central state and the party are fluid. With regards to this, it is worth noting that the anti-government rhetoric adopted by the Shiite party remained the same also when the Lebanese Parliament was mainly led by the March 8 coalition, which Hezbollah is part of. Even under the rule of former Lebanes Prime Minister of Najib Miqati’s government, considered to be politically close to Hezbollah, the inhabitants of Dahiye have viewed the central government as an enemy, not protecting its own people from Israeli invasions and destruction. That said, a reified ideological stance against the central state better serves the citizenship model that Hezbollah has been weaving over the years in Dahiye at the municipal level, which is considered participatory, especially after the end of the Israeli occupation of Lebanon (2000). Within this framework, the notion of citizenship must be understood as a social contract between local citizens and the Dahiye municipalities without a wider national implication. In light of these considerations, the language of orthodox citizenship struggles to describe the Lebanese scenario in terms of rights and responsibilities, which should be outside of the classic patterns constituting the nation-state. Nevertheless, a pragmatic notion of citizenship can still be a fundamental epistemic tool to identify the new lines of local inclusion and exclusion. In Dahiye, civic sense, as forwarded by sociologist Robert Putnam,31 i.e. acceptance of the rights and obligations that any citizenship implies, is still viewed as confessional by both locals and internationals, especially by residents who do not identify with the hegemonic territorial citizenship project implemented by the major local governor Hezbollah. Some of the testimonies that I collected in Dahiye seemed to attempt to challenge a hierarchical citizenship running along political affiliation lines, but still struggle to materialize in political actions which, in turn, would prompt an ideally assertive and well-functioning government to expand its sphere of social justice. This is due to the fact that the socio-economic betterment of a part of Dahiye is relatively recent, and to the instability of these suburbs in their permanent exposure to local and regional conflicts. As I have illustrated through the people’s own views, social welfare is selectively implemented and improved on the basis of the political ties that every individual or family develops by joining particular social networks. In this framework, I’d like to highlight that political action is still interpreted as an expression of identity rather than a mere Machiavellian strategy deployed to get benefits. Therefore, the stereotype around which the idea of Dahiye has been built throughout the decades—the no-go area hosting miserable Shiites always ‘ready to die’—leads to the interpretation of identity as a political incentive, rather than a performative act resulting from certain social and economic conditions. As a result, abstract Dahiye-categories such as ‘Shi‘a’ and ‘Palestinian refugees’ are arbitrarily used as identifiers of neat political individualities. The politics of the — not only “Islamic” — Resistance promoted by Hezbollah is still the predominant model of territorial citizenship, functioning as a cohesive factor of the dominant social fabric. The issue of the Resistance has emerged in my discussion since the research respondents have meaningfully associated economic improvement and access to services with the de jure compliance of the citizen with an official ethos woven by Dahiye’s governors in the public sphere. Like in any system of values and beliefs, defined in terms of social ethics, some local residents do not feel represented and therefore motivated to adhere to the ethical and political standards provided by the party. In those cases, de facto citizenship is suspended. This sociological analysis of Dahiye helps us to understand how, instead, the suspended citizenship of Hay al-Gharbe should be tracked down to different spatial and resettlement policies of neglect, which holds social ease and comfort of mobility hostage in the area by championing scant assistance provision for some while bypassing others, in compliance with an identity-driven dictatorship of resource distribution — and researchers’ attention. On the one hand, when adopting the perspective of local residents, citizenship is represented as a sense of belonging and in the form of territorial claim. On the other hand, it is also conceived by dissidents of local hegemony as the adoption of ethical values imposed from above. In this sense, de facto citizenship—although here meant as merely municipal—is held by the people who are willing to abide by Dahiye’s dominant ethics. Such de facto territorial citizens contribute to create, so to speak, a dictatorship of privileged or simply enfranchised individuals among the diversely definable vulnerable, and constituting, therefore, the only actual citizens within a still lax state. My critique of Dahiye’s homogeneization—which is certainly not new to local or international researchers—seeks to foreground how identity politics informs the politics of welfare, and how grotesque the ad hoc humanitarian intervention in Dahiye’s war-stricken districts is, while chronic non-war related vulnerability is neglected. In accordance with the emergency-driven logic of the humanitarian apparatus, any researcher—myself included—tends to approach the southern suburbs as though they were a mere site for writing wartime and post-war patho-graphies. Hence, in the framework of humanitarian assistance and long-term development projects proliferating in Dahiye after the 2006 July war, the heterogenous spaces of exclusion in the suburbs, cut out of the recent process of urban gentrification and hosting citizens whose lack of classifiable vulnerability denies to them access to services, struggle to stand out in the larger social habitat. Equipped with a larger overview of the suburbs’ environment, it has been possible to illustrate, in relation to citizen vulnerability, the social marginalization of refugee groups like the Palestinian people that I cited, chronically left out of the hegemonic model of citizenship municipally established by Hezbollah, as well as discriminated by state policies. Likewise, it was possible to see how even normative citizenship does not provide the very needy with basic resources, the slum of Hay al-Gharbe being an example. Therefore, politically unaffiliated citizens, inhabiting spaces which do not appear on official maps because they are less politically marked and demographically hybrid, find themselves in the same dire conditions as the (permanent) refugees. In an environment in which vulnerability is not only about exposure to war but also about the politics underlying these wars, if refugeehood and vulnerability too often run parallel by definition, holding the status of citizen can still lead to disempowerment. Estella Carpi is a final PhD Candidate in Social Anthropology at the University of Sydney, and a Social Science Researcher at Trends Research & Advisory. Since 2010, she has been conducting research on the social response to humanitarian assistance in Lebanon from the 2006 war against Israel until the Syrian refugee influx. After studying Arabic in Milan and Damascus (2002-2007), Carpi received her master’s degree from the University of Milan. Her dissertation focused on linguistic anthropology in Lebanon (2008). She has worked as a research consultant for the Cairo-based International Development Research Centre (2009-2010), focusing on social protection systems for vulnerable categories in Egypt, Lebanon, Yemen, Morocco, and Algeria. She has also worked for UNDP-Egypt in the Arab Trade and Development Program (2008). Ruth Benedict, Patterns of Culture, Boston, MA, Houghton Mifflin Harcourt Publishers, 1934. Rupen Das and Julie Davidson, Profiles of Poverty. The Human Face of Poverty in Lebanon, Mansourieh, Lebanon, ed. Niamh Fleming-Farrell, 2011. Lara Deeb and Mona Harb, “Piety and Leisure: Youth Negotiations of Moral Authority and new Leisure Sites in al-Dahiya”, Bahithat: Cultural Practices of Arab Youth, No. 14, Beirut, Lebanon, Bahithat Publication, 2010, pp. 414-427. Stefan Dercon, “Vulnerability: a Micro-Perspective”, QEH Working Paper Series, No. 149, Oxford, UK, Oxford University Press, 2006. Mona Harb, “La Dahiye de Beyrouth: parcours d’une stigmatisation urbaine, consolidation d’un territoire politique”, in Jean-Charles Depaule (ed. ), Les mots de la stigmatisation urbaine, Paris, UNESCO éditions, 2006, pp. 199-224. James Holston, Insurgent Citizenship: Disjunctions of Democracy and Modernity in Brazil, Princeton, NJ, Princeton University Press, 2009. Karam Karam, Le Mouvement Civil au Liban. Revendications, Protestations et Mobilisations Associatives dans l’Après-Guerre, Paris, Karthala-Iremam, 2006. Samir Khalaf, Heart of Beirut: reclaiming the Bourj, London, Saqi Books, 2006. Oscar Lewis, Five Families: Mexican Case Studies in the Culture of Poverty, New York, Basic Books, Inc., 1959. Jennifer Price Wolf, “Sociological Theories of Poverty in Urban America”, Journal of Human Behavior in the Social Environment, Vol. 16, No. 1-2, Taylor and Francis Online, 2007, pp. 41-56. Robert D. Putnam, Robert Leonardi, and Raffaella Y. Nanetti, Making Democracy Work: Civic Traditions in Modern Italy, Princeton, NJ, Princeton University Press, 1994. 1. Mona Harb, « La Dahiye de Beyrouth: parcours d’une stigmatisation urbaine, consolidation d’un territoire politique », in Jean-Charles Depaule (ed. ), Les mots de la stigmatisation urbaine, Paris, UNESCO éditions, 2006, pp. 199. 2. I opted for the term “vulnerability” rather than “urban poverty” to highlight the role that risk and uncertainty play in the residents’ lives. Indeed, they represent the vulnerable as defined by Dercon, that is the exposure to the risk of becoming poorer or remaining in poverty with no possibility of betterment due to longstanding neglect. Stefan Dercon, Vulnerability: a Micro-Perspective, QEH Working Paper Series No. 149, 2006. 3. Ruth Benedict, Patterns of Culture,Paperback, 1934. 4. Oscar Lewis, Five Families: Mexican Case Studies in the Culture of Poverty, New York, Basic Books, Inc., 1959, p. 3. 5. In this regard, I am highly indebted to J. from the Beit Atfal as-Sumoud, who indirectly became the gatekeeper to Hay al-Gharbe and my research experience there, and took me to Palestinian families living in the slum. 6. Rupen Das and Julie Davidson, “Profiles of Poverty: The Human Face of Poverty in Lebanon”, Mansourieh, Lebanon, ed. Niamh Fleming-Farrell, 2011. 7. Mona Harb, “La Dahiye de Beyrouth: parcours d’une stigmatisation urbaine, consolidation d’un territoire politique”, in Jean-Charles Depaule (ed. ), Les mots de la stigmatisation urbaine, Paris, UNESCO éditions, 2006, pp. 199-224. 8. ‘Abd-el-Rahim, Hay al-Gharbe, October 19, 2012. 9. Rupen Das and Julie Davidson, “Profiles of Poverty: The Human Face of Poverty in Lebanon”, Mansourieh, Lebanon, ed. Niamh Fleming-Farrell, 2011. 10. Samir Khalaf, Heart of Beirut: reclaiming the Bourj, London, Saqi Books, 2006. 11. Home visit in Hay al-Gharbe, January 29, 2013. 12. Hay al-Gharbe, February 11, 2013. 13. For Palestinians with no documents and not registered with UNRWA, like Najwan’s parents and siblings during the civil war years, access to services financed by the Palestinian Liberation Organization (PLO) has always been problematic. The PLO was forced out of Lebanon in 1982, and Palestinians in Lebanon are still not allowed to create associations (Ministerial Decree No. 17561 of 10th July 1962); the organizations that operate for them must include Lebanese staff and be registered in the country. Therefore, after the PLO’s withdrawal, the services for Palestinians were not replaced by anyone, apart from the Palestinian Red Crescent Society and UNRWA, which used to mediate with Shatila camp’s Popular Committee. 14. Hay al-Gharbe, January 21, 2013. 15. It was created in 1976 to shelter orphaned children victims of the bombing of the Tel az-Za‘tar camp by former Syrian President Hafez al-Asad. 17. Hay al-Gharbe, February 13, 2013. 18. Karam Karam, Le Mouvement Civil au Liban. Revendications, Protestations et Mobilisations Associatives dans l’Après-Guerre (1st ed. ), Paris, ed. Karthala-Iremam, 2006. 19. Rupen Das and Julie Davidson, Profiles of Poverty. The Human Face of Poverty in Lebanon,Mansourieh, Lebanon, ed. Niamh Fleming-Farrell, 2011. 20. In this regard, it is interesting to note that a larger number of NGOs and UN agencies have started providing a few services in the slum since the arrival of Syrian refugees, in particular starting 2012. Likewise, everyday crimes has received slightly more attention in light of the arrival of Syrian refugees, often depicted in the media as source of domestic insecurity. For instance, some male residents of Hay al-Gharbe joined anti-Syrian militias in opposition to Dahiye’s general political empathy with the Syrian regime. 21. Few NGOs still operate in Hay al-Gharbe. The one that has been providing health, social, and education services in the neighbourhood the longest is Tahaddi, collaborating with Terres des Hommes. Tahaddi, however, mostly targets refugees and Dom community members. 22. Jennifer Price Wolf, “Sociological Theories of Poverty in Urban America”, Journal of Human Behavior in the Social Environment, Vol. 16, No. 1-2, 2007, p. 53. 23. Mona Harb, « La Dahiye de Beyrouth: parcours d’une stigmatisation urbaine, consolidation d’un territoire politique », in Jean-Charles Depaule (ed. ), Les mots de la stigmatisation urbaine, Paris, UNESCO éditions, 2006, pp. 199-224. 24. Lara Deeb and Mona Harb, “Piety and Leisure: Youth Negotiations of Moral Authority and new Leisure Sites in al-Dahiya”, Bahithat: Cultural Practices of Arab Youth, No. 14, 2010, pp. 414-427. 25. James Holston, Insurgent Citizenship: Disjunctions of Democracy and Modernity in Brazil, Princeton, NJ, Princeton University Press, 2009. 26. Haret Hreik, January 27, 2012. 27. Bi’r al-‘Abed, January 23, 2012. 28. Al-Ghobeiry, October 13, 2011. 29. Haret Hreik, October 15, 2011. 30. Al-Mreije, Beirut, October 31, 2012. 31. Robert D. Putnam, Robert Leonardi, and Raffaella Y. Nanetti, Making Democracy Work: Civic Traditions in Modern Italy, Princeton, NJ, Princeton University Press, 1994. 32. Mona Harb, “La Dahiye de Beyrouth: parcours d’une stigmatisation urbaine, consolidation d’un territoire politique”, in Jean-Charles Depaule (ed. ), Les mots de la stigmatisation urbaine, Paris, UNESCO éditions, 2006, pp. 199-224.